Socrates (; Greek: Σωκράτης [sɔːkrátɛːs], Sōkrátēs; 470/469 – 399 BC) was a classical Greek (Athenian) philosopher credited as one of the founders of Western philosophy. He is an enigmatic figure known chiefly through the accounts of classical writers, especially the writings of his students Plato and Xenophon and the plays of his contemporary Aristophanes. Plato's dialogues are among the most comprehensive accounts of Socrates to survive from antiquity, though it is unclear the degree to which Socrates himself is "hidden behind his 'best disciple', Plato". Through his portrayal in Plato's dialogues, Socrates has become renowned for his contribution to the field of ethics, and it is this Platonic Socrates who lends his name to the concepts of Socratic irony and the Socratic method, or elenchus. The latter remains a commonly used tool in a wide range of discussions, and is a type of pedagogy in which a series of questions is asked not only to draw individual answers, but also to encourage fundamental insight into the issue at hand. Plato's Socrates also made important and lasting contributions to the field of epistemology, and his ideologies and approach have proven a strong foundation for much Western philosophy that has followed. Nothing written by Socrates remains extant. As a result, information about him and his philosophies depends upon secondary sources. Furthermore, close comparison between the contents of these sources reveals contradictions, thus creating concerns about the possibility of knowing in-depth the real Socrates. This issue is known as the Socratic problem, or the Socratic question. To understand Socrates and his thought, one must turn primarily to the works of Plato, whose dialogues are thought the most informative source about Socrates' life and philosophy, and also Xenophon. These writings are the Sokratikoi logoi, or Socratic dialogues, which consist of reports of conversations apparently involving Socrates. As for discovering the real-life Socrates, the difficulty is that ancient sources are mostly philosophical or dramatic texts, apart from Xenophon. There are no straightforward histories, contemporary with Socrates, that dealt with his own time and place. A corollary of this is that sources that do mention Socrates do not necessarily claim to be historically accurate, and are often partisan. For instance, those who prosecuted and convicted Socrates have left no testament. Historians therefore face the challenge of reconciling the various evidence from the extant texts in order to attempt an accurate and consistent account of Socrates' life and work. The result of such an effort is not necessarily realistic, even if consistent. Amid all the disagreement resulting from differences within sources, two factors emerge from all sources pertaining to Socrates. It would seem, therefore, that he was ugly, and that Socrates had a brilliant intellect. 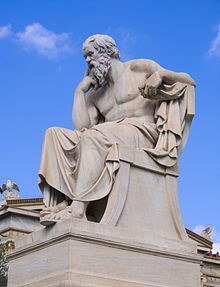 The character of Socrates as exhibited in Apology, Crito, Phaedo and Symposium concurs with other sources to an extent to which it seems possible to rely on the Platonic Socrates, as demonstrated in the dialogues, as a representation of the actual Socrates as he lived in history. At the same time, however, many scholars believe that in some works, Plato, being a literary artist, pushed his avowedly brightened-up version of "Socrates" far beyond anything the historical Socrates was likely to have done or said. Also, Xenophon, being an historian, is a more reliable witness to the historical Socrates. It is a matter of much debate over which Socrates it is whom Plato is describing at any given point—the historical figure, or Plato's fictionalization. As British philosopher Martin Cohen has put it, "Plato, the idealist, offers an idol, a master figure, for philosophy. A Saint, a prophet of 'the Sun-God', a teacher condemned for his teachings as a heretic." It is also clear from other writings and historical artefacts, that Socrates was not simply a character, nor an invention, of Plato. The testimony of Xenophon and Aristotle, alongside some of Aristophanes' work (especially The Clouds), is useful in fleshing out a perception of Socrates beyond Plato's work. The problem with discerning Socrates' philosophical views stems from the perception of contradictions in statements made by the Socrates in the different dialogues of Plato. These contradictions produce doubt as to the actual philosophical doctrines of Socrates, within his milieu and as recorded by other individuals. Aristotle, in his Magna Moralia, refers to Socrates in words which make it patent that the doctrine virtue is knowledge was held by Socrates. Within the Metaphysics, he states Socrates was occupied with the search for moral virtues, being the 'first to search for universal definitions for them '. The problem of understanding Socrates as a philosopher is shown in the following: In Xenophon's Symposium, Socrates is reported as saying he devotes himself only to what he regards as the most important art or occupation, that of discussing philosophy. However, in The Clouds, Aristophanes portrays Socrates as accepting payment for teaching and running a sophist school with Chaerephon. Also, in Plato's Apology and Symposium, as well as in Xenophon's accounts, Socrates explicitly denies accepting payment for teaching. More specifically, in the Apology, Socrates cites his poverty as proof that he is not a teacher. Two fragments are extant of the writings by Timon of Phlius pertaining to Socrates, although Timon is known to have written to ridicule and lampoon philosophy. Carnelian gem imprint representing Socrates, Rome, 1st century BC-1st century AD. Details about the life of Socrates can be derived from three contemporary sources: the dialogues of Plato and Xenophon (both devotees of Socrates), and the plays of Aristophanes. He has been depicted by some scholars, including Eric Havelock and Walter Ong, as a champion of oral modes of communication, standing against the haphazard diffusion of writing. In Aristophanes' play The Clouds, Socrates is made into a clown of sorts, particularly inclined toward sophistry, who teaches his students how to bamboozle their way out of debt. However, since most of Aristophanes' works function as parodies, it is presumed that his characterization in this play was also not literal. Socrates first worked as a stonemason, and there was a tradition in antiquity, not credited by modern scholarship, that Socrates crafted the statues of the Three Graces, which stood near the Acropolis until the 2nd century AD. Xenophon reports that because youths were not allowed to enter the Agora, they used to gather in workshops surrounding it. Socrates frequented these shops in order to converse with the merchants. Most notable among them was Simon the Shoemaker. For a time, Socrates fulfilled the role of hoplite, participating in the Peloponnesian war—a conflict which stretched intermittently over a period spanning 431 to 404 B.C. Several of Plato's dialogues refer to Socrates' military service. In the monologue of the Apology, Socrates states he was active for Athens in the battles of Amphipolis, Delium, and Potidaea. In the Symposium, Alcibiades describes Socrates' valour in the battles of Potidaea and Delium, recounting how Socrates saved his life in the former battle (219e-221b). Socrates' exceptional service at Delium is also mentioned in the Laches by the General after whom the dialogue is named (181b). In the Apology, Socrates compares his military service to his courtroom troubles, and says anyone on the jury who thinks he ought to retreat from philosophy must also think soldiers should retreat when it seems likely that they will be killed in battle. During 406, he participated as a member of the Boule. His tribe the Antiochis held the Prytany on the day it was debated what fate should befall the generals of the Battle of Arginusae, who abandoned the slain and the survivors of foundered ships to pursue the defeated Spartan navy. According to Xenophon, Socrates was the Epistates for the debate, but Delebecque and Hatzfeld think this is an embellishment, because Xenophon composed the information after Socrates' death. The generals were seen by some to have failed to uphold the most basic of duties, and the people decided upon capital punishment. However, when the prytany responded by refusing to vote on the issue, the people reacted with threats of death directed at the prytany itself. They relented, at which point Socrates alone as epistates blocked the vote, which had been proposed by Callixeinus. The reason he gave was that "in no case would he act except in accordance with the law". The outcome of the trial was ultimately judged to be a miscarriage of justice, or illegal, but, actually, Socrates' decision had no support from written statutory law, instead being reliant on favouring a continuation of less strict and less formal nomos law. Plato's Apology, parts 32c to 32d, describes how Socrates and four others were summoned to the Tholos, and told by representatives of the oligarchy of the Thirty (the oligarchy began ruling in 404 B.C.) to go to Salamis, and from there, to return to them with Leon the Salaminian. He was to be brought back to be subsequently executed. However, Socrates returned home and did not go to Salamis as he was expected to. Socrates lived during the time of the transition from the height of the Athenian hegemony to its decline with the defeat by Sparta and its allies in the Peloponnesian War. At a time when Athens sought to stabilize and recover from its humiliating defeat, the Athenian public may have been entertaining doubts about democracy as an efficient form of government. Socrates appears to have been a critic of democracy, and some scholars interpret his trial as an expression of political infighting. Claiming loyalty to his city, Socrates clashed with the current course of Athenian politics and society. He praises Sparta, archrival to Athens, directly and indirectly in various dialogues. One of Socrates' purported offenses to the city was his position as a social and moral critic. Rather than upholding a status quo and accepting the development of what he perceived as immorality within his region, Socrates questioned the collective notion of "might makes right" that he felt was common in Greece during this period. Plato refers to Socrates as the "gadfly" of the state (as the gadfly stings the horse into action, so Socrates stung various Athenians), insofar as he irritated some people with considerations of justice and the pursuit of goodness. His attempts to improve the Athenians' sense of justice may have been the cause of his execution. According to Plato's Apology, Socrates' life as the "gadfly" of Athens began when his friend Chaerephon asked the oracle at Delphi if anyone were wiser than Socrates; the Oracle responded that no-one was wiser. Socrates believed the Oracle's response was not correct, because he believed he possessed no wisdom whatsoever. He proceeded to test the riddle by approaching men considered wise by the people of Athens—statesmen, poets, and artisans—in order to refute the Oracle's pronouncement. Questioning them, however, Socrates concluded: while each man thought he knew a great deal and was wise, in fact they knew very little and were not wise at all. Socrates realized the Oracle was correct; while so-called wise men thought themselves wise and yet were not, he himself knew he was not wise at all, which, paradoxically, made him the wiser one since he was the only person aware of his own ignorance. Socrates' paradoxical wisdom made the prominent Athenians he publicly questioned look foolish, turning them against him and leading to accusations of wrongdoing. Socrates defended his role as a gadfly until the end: at his trial, when Socrates was asked to propose his own punishment, he suggested a wage paid by the government and free dinners for the rest of his life instead, to finance the time he spent as Athens' benefactor. He was, nevertheless, found guilty of both corrupting the minds of the youth of Athens and of impiety ("not believing in the gods of the state"), and subsequently sentenced to death by drinking a mixture containing poison hemlock. He believed such a flight would indicate a fear of death, which he believed no true philosopher has. If he fled Athens his teaching would fare no better in another country, as he would continue questioning all he met and undoubtedly incur their displeasure. Having knowingly agreed to live under the city's laws, he implicitly subjected himself to the possibility of being accused of crimes by its citizens and judged guilty by its jury. To do otherwise would have caused him to break his "social contract" with the state, and so harm the state, an unprincipled act. If he escaped at the instigation of his friends, then his friends would become liable in law. The full reasoning behind his refusal to flee is the main subject of the Crito. Socrates' death is described at the end of Plato's Phaedo. Socrates turned down Crito's pleas to attempt an escape from prison. After drinking the poison, he was instructed to walk around until his legs felt numb. After he lay down, the man who administered the poison pinched his foot; Socrates could no longer feel his legs. The numbness slowly crept up his body until it reached his heart. Shortly before his death, Socrates speaks his last words to Crito: "Crito, we owe a rooster to Asclepius. Please, don't forget to pay the debt." Asclepius was the Greek god for curing illness, and it is likely Socrates' last words meant that death is the cure—and freedom, of the soul from the body. Additionally, in Why Socrates Died: Dispelling the Myths, Robin Waterfield adds another interpretation of Socrates' last words. He suggests that Socrates was a voluntary scapegoat; his death was the purifying remedy for Athens' misfortunes. In this view, the token of appreciation for Asclepius would represent a cure for Athens' ailments. Perhaps his most important contribution to Western thought is his dialectic method of inquiry, known as the Socratic method or method of "elenchus", which he largely applied to the examination of key moral concepts such as the Good and Justice. It was first described by Plato in the Socratic Dialogues. To solve a problem, it would be broken down into a series of questions, the answers to which gradually distill the answer a person would seek. The influence of this approach is most strongly felt today in the use of the scientific method, in which hypothesis is the first stage. The development and practice of this method is one of Socrates' most enduring contributions, and is a key factor in earning his mantle as the father of political philosophy, ethics or moral philosophy, and as a figurehead of all the central themes in Western philosophy.The Socratic method has often been considered as a defining element of American legal education. To illustrate the use of the Socratic method, a series of questions are posed to help a person or group to determine their underlying beliefs and the extent of their knowledge. The Socratic method is a negative method of hypothesis elimination, in that better hypotheses are found by steadily identifying and eliminating those that lead to contradictions. It was designed to force one to examine one's own beliefs and the validity of such beliefs. An alternative interpretation of the dialectic is that it is a method for direct perception of the Form of the Good. Philosopher Karl Popper describes the dialectic as "the art of intellectual intuition, of visualising the divine originals, the Forms or Ideas, of unveiling the Great Mystery behind the common man's everyday world of appearances." In a similar vein, French philosopher Pierre Hadot suggests that the dialogues are a type of spiritual exercise. Hadot writes that "in Plato's view, every dialectical exercise, precisely because it is an exercise of pure thought, subject to the demands of the Logos, turns the soul away from the sensible world, and allows it to convert itself towards the Good." The beliefs of Socrates, as distinct from those of Plato, are difficult to discern. Little in the way of concrete evidence exists to demarcate the two. The lengthy presentation of ideas given in most of the dialogues may be the ideas of Socrates himself, but which have been subsequently deformed or changed by Plato, and some scholars think Plato so adapted the Socratic style as to make the literary character and the philosopher himself impossible to distinguish. Others argue that he did have his own theories and beliefs. There is a degree of controversy inherent in the identifying of what these might have been, owing to the difficulty of separating Socrates from Plato and the difficulty of interpreting even the dramatic writings concerning Socrates. Consequently, distinguishing the philosophical beliefs of Socrates from those of Plato and Xenophon has not proven easy, so it must be remembered that what is attributed to Socrates might actually be more the specific concerns of these two thinkers instead. The matter is complicated because the historical Socrates seems to have been notorious for asking questions but not answering, claiming to lack wisdom concerning the subjects about which he questioned others. If anything in general can be said about the philosophical beliefs of Socrates, it is that he was morally, intellectually, and politically at odds with many of his fellow Athenians. When he is on trial for heresy and corrupting the minds of the youth of Athens, he uses his method of elenchos to demonstrate to the jurors that their moral values are wrong-headed. He tells them they are concerned with their families, careers, and political responsibilities when they ought to be worried about the "welfare of their souls". Socrates' assertion that the gods had singled him out as a divine emissary seemed to provoke irritation, if not outright ridicule. Socrates also questioned the Sophistic doctrine that arete (virtue) can be taught. He liked to observe that successful fathers (such as the prominent military general Pericles) did not produce sons of their own quality. Socrates argued that moral excellence was more a matter of divine bequest than parental nurture. This belief may have contributed to his lack of anxiety about the future of his own sons. According to Xenophon, he was a teleologist who held that god arranges everything for the best. Socrates frequently says his ideas are not his own, but his teachers'. He mentions several influences: Prodicus the rhetor and Anaxagoras the philosopher. Perhaps surprisingly, Socrates claims to have been deeply influenced by two women besides his mother: he says that Diotima (cf. Plato's Symposium), a witch and priestess from Mantinea, taught him all he knows about eros, or love; and that Aspasia, the mistress of Pericles, taught him the art of rhetoric. John Burnet argued that his principal teacher was the Anaxagorean Archelaus but his ideas were as Plato described them; Eric A. Havelock, on the other hand, considered Socrates' association with the Anaxagoreans to be evidence of Plato's philosophical separation from Socrates. No one errs or does wrong willingly or knowingly. Virtue is sufficient for happiness. The term, "Socratic paradox" can also refer to a self-referential paradox, originating in Socrates' utterance, "what I do not know I do not think I know", often paraphrased as "I know that I know nothing." The statement "I know that I know nothing" is often attributed to Socrates, based on a statement in Plato's Apology. The conventional interpretation of this is that Socrates' wisdom was limited to an awareness of his own ignorance. Socrates considered virtuousness to require or consist of phronēsis, "thought, sense, judgement, practical wisdom, [and] prudence." Therefore, he believed that wrongdoing and behaviour that was not virtuous resulted from ignorance, and that those who did wrong knew no better. The one thing Socrates claimed to have knowledge of was "the art of love" (ta erôtikê). This assertion seems to be associated with the word erôtan, which means to ask questions. Therefore, Socrates is claiming to know about the art of love, insofar as he knows how to ask questions. The only time he actually claimed to be wise was within Apology, in which he says he is wise "in the limited sense of having human wisdom". It is debatable whether Socrates believed humans (as opposed to gods like Apollo) could actually become wise. On the one hand, he drew a clear line between human ignorance and ideal knowledge; on the other, Plato's Symposium (Diotima's Speech) and Republic (Allegory of the Cave) describe a method for ascending to wisdom. In Plato's Theaetetus (150a), Socrates compares his treatment of the young people who come to him for philosophical advice to the way midwives treat their patients, and the way matrimonial matchmakers act. He says that he himself is a true matchmaker (προμνηστικός promnestikós) in that he matches the young man to the best philosopher for his particular mind. However, he carefully distinguishes himself from a panderer (προᾰγωγός proagogos) or procurer. This distinction is echoed in Xenophon's Symposium (3.20), when Socrates jokes about his certainty of being able to make a fortune, if he chose to practice the art of pandering. For his part as a philosophical interlocutor, he leads his respondent to a clearer conception of wisdom, although he claims he is not himself a teacher (Apology). His role, he claims, is more properly to be understood as analogous to a midwife (μαῖα maia). In the Theaetetus, Socrates explains that he is himself barren of theories, but knows how to bring the theories of others to birth and determine whether they are worthy or mere "wind eggs" (ἀνεμιαῖον anemiaion). Perhaps significantly, he points out that midwives are barren due to age, and women who have never given birth are unable to become midwives; they would have no experience or knowledge of birth and would be unable to separate the worthy infants from those that should be left on the hillside to be exposed. To judge this, the midwife must have experience and knowledge of what she is judging. Socrates believed the best way for people to live was to focus on the pursuit of virtue rather than the pursuit, for instance, of material wealth. He always invited others to try to concentrate more on friendships and a sense of true community, for Socrates felt this was the best way for people to grow together as a populace. His actions lived up to this standard: in the end, Socrates accepted his death sentence when most thought he would simply leave Athens, as he felt he could not run away from or go against the will of his community; as mentioned above, his reputation for valor on the battlefield was without reproach. The idea that there are certain virtues formed a common thread in Socrates' teachings. These virtues represented the most important qualities for a person to have, foremost of which were the philosophical or intellectual virtues. Socrates stressed that "the unexamined life is not worth living [and] ethical virtue is the only thing that matters." It is argued that Socrates believed "ideals belong in a world only the wise man can understand", making the philosopher the only type of person suitable to govern others. In Plato's dialogue the Republic, Socrates openly objected to the democracy that ran Athens during his adult life. It was not only Athenian democracy: Socrates found short of ideal any government that did not conform to his presentation of a perfect regime led by philosophers, and Athenian government was far from that. It is, however, possible that the Socrates of Plato's Republic is colored by Plato's own views. During the last years of Socrates' life, Athens was in continual flux due to political upheaval. Democracy was at last overthrown by a junta known as the Thirty Tyrants, led by Plato's relative, Critias, who had once been a student and friend of Socrates. The Tyrants ruled for about a year before the Athenian democracy was reinstated, at which point it declared an amnesty for all recent events. Socrates' opposition to democracy is often denied, and the question is one of the biggest philosophical debates when trying to determine exactly what Socrates believed. 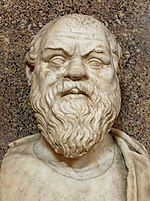 The strongest argument of those who claim Socrates did not actually believe in the idea of philosopher kings is that the view is expressed no earlier than Plato's Republic, which is widely considered one of Plato's "Middle" dialogues and not representative of the historical Socrates' views. Furthermore, according to Plato's Apology of Socrates, an "early" dialogue, Socrates refused to pursue conventional politics; he often stated he could not look into other's matters or tell people how to live their lives when he did not yet understand how to live his own. He believed he was a philosopher engaged in the pursuit of Truth, and did not claim to know it fully. Socrates' acceptance of his death sentence after his conviction can also be seen to support this view. It is often claimed much of the anti-democratic leanings are from Plato, who was never able to overcome his disgust at what was done to his teacher. In any case, it is clear Socrates thought the rule of the Thirty Tyrants was also objectionable; when called before them to assist in the arrest of a fellow Athenian, Socrates refused and narrowly escaped death before the Tyrants were overthrown. He did, however, fulfill his duty to serve as Prytanis when a trial of a group of Generals who presided over a disastrous naval campaign were judged; even then, he maintained an uncompromising attitude, being one of those who refused to proceed in a manner not supported by the laws, despite intense pressure. Judging by his actions, he considered the rule of the Thirty Tyrants less legitimate than the Democratic Senate that sentenced him to death. Socrates' apparent respect for democracy is one of the themes emphasized in the 2008 play Socrates on Trial by Andrew David Irvine. Irvine argues that it was because of his loyalty to Athenian democracy that Socrates was willing to accept the verdict of his fellow citizens. As Irvine puts it, "During a time of war and great social and intellectual upheaval, Socrates felt compelled to express his views openly, regardless of the consequences. As a result, he is remembered today, not only for his sharp wit and high ethical standards, but also for his loyalty to the view that in a democracy the best way for a man to serve himself, his friends, and his city—even during times of war—is by being loyal to, and by speaking publicly about, the truth." In the Dialogues of Plato, though Socrates sometimes seems to support a mystical side, discussing reincarnation and the mystery religions, this is generally attributed to Plato. Regardless, this view of Socrates cannot be dismissed out of hand, as we cannot be sure of the differences between the views of Plato and Socrates; in addition, there seem to be some corollaries in the works of Xenophon. In the culmination of the philosophic path as discussed in Plato's Symposium, one comes to the Sea of Beauty or to the sight of "the beautiful itself" (211C); only then can one become wise. (In the Symposium, Socrates credits his speech on the philosophic path to his teacher, the priestess Diotima, who is not even sure if Socrates is capable of reaching the highest mysteries.) In the Meno, he refers to the Eleusinian Mysteries, telling Meno he would understand Socrates' answers better if only he could stay for the initiations next week. Further confusions result from the nature of these sources, insofar as the Platonic Dialogues are arguably the work of an artist-philosopher, whose meaning does not volunteer itself to the passive reader nor again the lifelong scholar. According to Olympiodorus the Younger in his Life of Plato, Plato himself "received instruction from the writers of tragedy" before taking up the study of philosophy. His works are, indeed, dialogues; Plato's choice of this, the medium of Sophocles, Euripides, and the fictions of theatre, may reflect the ever-interpretable nature of his writings, as he has been called a "dramatist of reason". What is more, the first word of nearly all Plato's works is a significant term for that respective dialogue, and is used with its many connotations in mind. Finally, the Phaedrus and the Symposium each allude to Socrates' coy delivery of philosophic truths in conversation; the Socrates of the Phaedrus goes so far as to demand such dissembling and mystery in all writing. The covertness we often find in Plato, appearing here and there couched in some enigmatic use of symbol and/or irony, may be at odds with the mysticism Plato's Socrates expounds in some other dialogues. These indirect methods may fail to satisfy some readers. Perhaps the most interesting facet of this is Socrates' reliance on what the Greeks called his "daimōnic sign", an averting (ἀποτρεπτικός apotreptikos) inner voice Socrates heard only when he was about to make a mistake. It was this sign that prevented Socrates from entering into politics. In the Phaedrus, we are told Socrates considered this to be a form of "divine madness", the sort of insanity that is a gift from the gods and gives us poetry, mysticism, love, and even philosophy itself. Alternately, the sign is often taken to be what we would call "intuition"; however, Socrates' characterization of the phenomenon as daimōnic may suggest that its origin is divine, mysterious, and independent of his own thoughts. Today, such a voice would be classified under the Diagnostic and Statistical Manual of Mental Disorders as a command hallucination. Socrates practiced and advocated divination. Xenophon was thought skilled at foretelling from sacrifices, and attributed many of his knowledges to Socrates within his writing "The Cavalry Commander". He was prominently lampooned in Aristophanes' comedy The Clouds, produced when Socrates was in his mid-forties; he said at his trial (according to Plato) that the laughter of the theater was a harder task to answer than the arguments of his accusers. Søren Kierkegaard believed this play was a more accurate representation of Socrates than those of his students. In the play, Socrates is ridiculed for his dirtiness, which is associated with the Laconizing fad; also in plays by Callias, Eupolis, and Telecleides. Other comic poets who lampooned Socrates include Mnesimachus and Ameipsias. In all of these, Socrates and the Sophists were criticized for "the moral dangers inherent in contemporary thought and literature". Plato, Xenophon, and Aristotle are the main sources for the historical Socrates; however, Xenophon and Plato were students of Socrates, and they may idealize him; however, they wrote the only continuous descriptions of Socrates that have come down to us in their complete form. Aristotle refers frequently, but in passing, to Socrates in his writings. Almost all of Plato's works center on Socrates. However, Plato's later works appear to be more his own philosophy put into the mouth of his mentor. The Socratic Dialogues are a series of dialogues written by Plato and Xenophon in the form of discussions between Socrates and other persons of his time, or as discussions between Socrates' followers over his concepts. Plato's Phaedo is an example of this latter category. Although his Apology is a monologue delivered by Socrates, it is usually grouped with the Dialogues. The Apology professes to be a record of the actual speech Socrates delivered in his own defense at the trial. In the Athenian jury system, an "apology" is composed of three parts: a speech, followed by a counter-assessment, then some final words. "Apology" is a transliteration, not a translation, of the Greek apologia, meaning "defense"; in this sense it is not apologetic according to our contemporary use of the term. Plato generally does not place his own ideas in the mouth of a specific speaker; he lets ideas emerge via the Socratic Method, under the guidance of Socrates. Most of the dialogues present Socrates applying this method to some extent, but nowhere as completely as in the Euthyphro. In this dialogue, Socrates and Euthyphro go through several iterations of refining the answer to Socrates' question, "...What is the pious, and what the impious?" In Plato's Dialogues, learning appears as a process of remembering. The soul, before its incarnation in the body, was in the realm of Ideas (very similar to the Platonic "Forms"). There, it saw things the way they truly are, rather than the pale shadows or copies we experience on earth. By a process of questioning, the soul can be brought to remember the ideas in their pure form, thus bringing wisdom. Especially for Plato's writings referring to Socrates, it is not always clear which ideas brought forward by Socrates (or his friends) actually belonged to Socrates and which of these may have been new additions or elaborations by Plato—this is known as the Socratic Problem. Generally, the early works of Plato are considered to be close to the spirit of Socrates, whereas the later works—including Phaedo and Republic—are considered to be possibly products of Plato's elaborations. Immediately, the students of Socrates set to work both on exercising their perceptions of his teachings in politics and also on developing many new philosophical schools of thought. Some of Athens' controversial and anti-democratic tyrants were contemporary or posthumous students of Socrates including Alcibiades and Critias. Critias' cousin Plato would go on to found the Academy in 385 BC, which gained so much renown that "Academy" became the standard word for educational institutions in later European languages such as English, French, and Italian. Plato's protege, another important figure of the Classical era, Aristotle went on to tutor Alexander the Great and also to found his own school in 335 BC—the Lyceum—whose name also now means an educational institution. While "Socrates dealt with moral matters and took no notice at all of nature in general", in his Dialogues, Plato would emphasize mathematics with metaphysical overtones mirroring that of Pythagoras – the former who would dominate Western thought well into the Renaissance. Aristotle himself was as much of a philosopher as he was a scientist with extensive work in the fields of biology and physics. Socratic thought which challenged conventions, especially in stressing a simplistic way of living, became divorced from Plato's more detached and philosophical pursuits. This idea was inherited by one of Socrates' older students, Antisthenes, who became the originator of another philosophy in the years after Socrates' death: Cynicism. The idea of asceticism being hand in hand with an ethical life or one with piety, ignored by Plato and Aristotle and somewhat dealt with by the Cynics, formed the core of another philosophy in 281 BC—Stoicism when Zeno of Citium would discover Socrates' works and then learn from Crates, a Cynic philosopher. While some of the later contributions of Socrates to Hellenistic Era culture and philosophy as well as the Roman Era have been lost to time, his teachings began a resurgence in both medieval Europe and the Islamic Middle East alongside those of Aristotle and Stoicism. Socrates is mentioned in the dialogue Kuzari by Jewish philosopher and rabbi Yehuda Halevi in which a Jew instructs the Khazar king about Judaism. 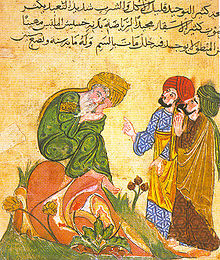 Al-Kindi, a well-known Arabic philosopher, introduced and tried to reconcile Socrates and Hellenistic philosophy to an Islamic audience, referring to him by the name 'Suqrat'. Socrates' stature in Western philosophy returned in full force with the Renaissance and the Age of Reason in Europe when political theory began to resurface under those like Locke and Hobbes. Voltaire even went so far as to write a satirical play about the Trial of Socrates. 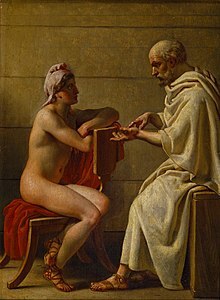 There were a number of paintings about his life including Socrates Tears Alcibiades from the Embrace of Sensual Pleasure by Jean-Baptiste Regnault and The Death of Socrates by Jacques-Louis David in the later 18th century. To this day, the Socratic Method is still used in classroom and law school discourse to expose underlying issues in both subject and the speaker. He has been recognized with accolades ranging from frequent mentions in pop culture (such as the movie Bill & Ted's Excellent Adventure and a Greek rock band called Socrates Drank the Conium) to numerous busts in academic institutions in recognition of his contribution to education. Over the past century, numerous plays about Socrates have also focused on Socrates' life and influence. One of the most recent has been Socrates on Trial, a play based on Aristophanes' Clouds and Plato's Apology, Crito, and Phaedo, all adapted for modern performance. 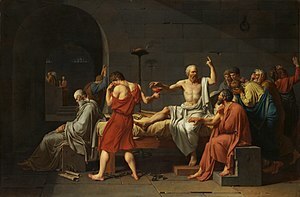 Evaluation of and reaction to Socrates has been undertaken by both historians and philosophers from the time of his death to the present day with a multitude of conclusions and perspectives. Although he was not directly prosecuted for his connection to Critias, leader of the Spartan-backed Thirty Tyrants, and "showed considerable personal courage in refusing to submit to [them]", he was seen by some as a figure who mentored oligarchs who became abusive tyrants, and undermined Athenian democracy. The Sophistic movement that he railed at in life survived him, but by the 3rd century BC, was rapidly overtaken by the many philosophical schools of thought that Socrates influenced. Socrates' death is considered iconic and his status as a martyr of philosophy overshadows most contemporary and posthumous criticism. However, Xenophon mentions Socrates' "arrogance" and that he was "an expert in the art of primping" or "self-presentation". Direct criticism of Socrates the man almost disappears after this time, but there is a noticeable preference for Plato or Aristotle over the elements of Socratic philosophy distinct from those of his students, even into the Middle Ages. Some modern scholarship holds that, with so much of his own thought obscured and possibly altered by Plato, it is impossible to gain a clear picture of Socrates amid all the contradictory evidence. That both Cynicism and Stoicism, which carried heavy influence from Socratic thought, were unlike or even contrary to Platonism further illustrates this. The ambiguity and lack of reliability serves as the modern basis of criticism—that it is nearly impossible to know the real Socrates. Some controversy also exists about Socrates' attitude towards homosexuality and as to whether or not he believed in the Olympian gods, was monotheistic, or held some other religious viewpoint. However, it is still commonly taught and held with little exception that Socrates is the progenitor of subsequent Western philosophy, to the point that philosophers before him are referred to as pre-Socratic. Socrates is a major character in Mary Renault's historical novel The Last of the Wine. The book's protagonists, Alexias and Lysis, study under him in Athens. A humorous version of the deceased Socrates appears in John Kendrick Bangs's comic novel A House-Boat on the Styx and its sequels. Socrates is the main character in R. L. Prendergast's novel The Confessions of Socrates. In the book, Socrates sits in prison in Athens awaiting his death sentence and writes the story of his life to his sons. What's the good word on Socrates?